There are a number of different swimming pool PH test kits on the market today. We’ll look at how to use the two most popular test kits; Pool Test Strips and Pool Liquid Drop Test Kits. The number of swimming pool owners using test strips is increasing in number and is because this method of testing is so easy to do. 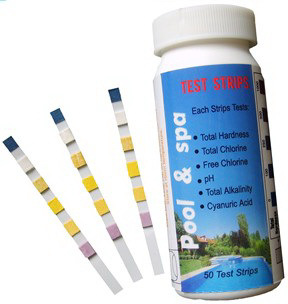 Before you can test for PH, make sure your pool test strips test for PH. It will be written on the side of the package. Remove a strip from the package and dunk it in the pool water for 5-10 seconds or as directed on the pack. Remove it from the water and wait 10-15 seconds. After this time the pads on the test strip will change colour. Using the chart that’s on the instructions of the test strips, locate the pad on the strip for PH level. Compare the colour of the strip against the pack. Add chemicals to correct the PH if required. See instructions below. This is the old school way of testing your pool PH level. It takes a little longer and is a bit more complex than using test strips. Use the container provided with the kit and plunge it into the pool water upside down. Go down to your elbow in depth. And then pull the container up and level it off as instructed by the kit. Take the drops for testing PH level from the kit and put the number of drops into the water sample as indicated by the instructions. Wait for the water sample to change colour. Then using the colour chart that came with the kit, compare the colour of the water sample to the chart. Note the reading. If the PH level is too low, add Soda Ash (Sodium Carbonate). You could also add ‘alkaline increaser’ or ‘alkaline up’ if you don’t want to use soda ash. If the PH level is too high, the most common chemical to add is muriatic acid – typically 30% – 35% liquid hydrochloric acid.